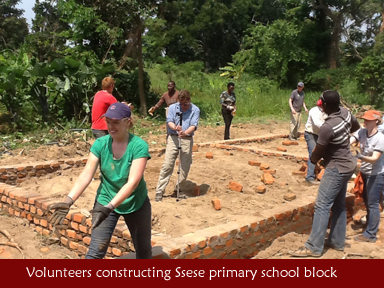 A group of 17 volunteers from Treasure vally Church of Christ in Boise Idaho USA blessed our Chidren's Sure House project in Ssese Island, Maboga Village, Kalangala district when they came to voluntalily construct construct a modern 4 classroom block at our CSH project. When children graduated from top class, nursery or pre-primary, they could not walk a 5 KM distance through the forest and palm trees to a government school. This problem hindered Maboga fishing village from acquiring education to a high school level. At 8years, most of the kids resorted to fishing, encouraged by their parents in order to support the family income, thus a vicious circle of poverty and iliteracy. It is against this background that CSH agreed to come to this community in 2009 to participate in the development of this community. 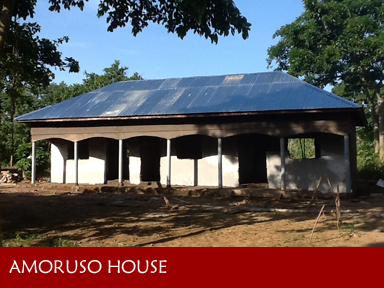 Amoruso house was donated by a brave, good hearted young girl called Danielle Amoruso. Introduced to CSH by disciples in Potamack Church of Christ in Virginia USA in 2011, Danielle contributed money through her community and came herself to participate in building this house. Today, the house is used as a dormitory for volunteers and classroom for kids in Primary One. Thank you Danielle!!! 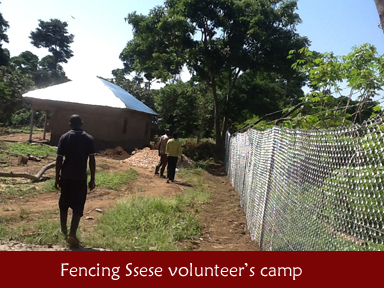 With funds donated by volunteers from Treasure Valley Church of Christ in Boise Idaho, we were able to construct a dinning hall, School toilets, volunteers showers and toilets, two wooden houses used as staff houses and stores, volunteer's Model house and cleared/sprayed the dense forest. 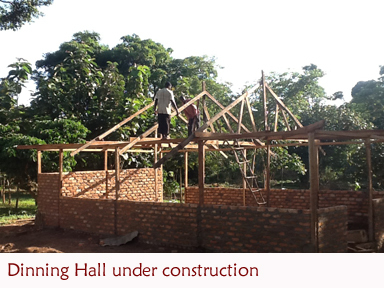 CSH is therfore appealing to volunteers to come and support us in building this school, teach in classrooms and engage in other community development works. This is a one bedroom house with a sitting room ideal for long term volunteers. 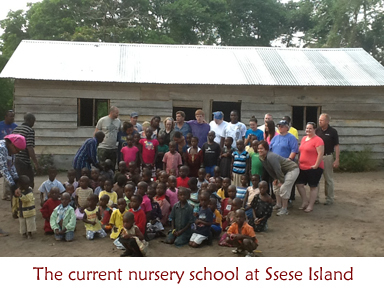 The school project is seperated from the volunteer's accommodation. However, kids use some of those rooms as classrooms until the 4 classroom school block is finished. 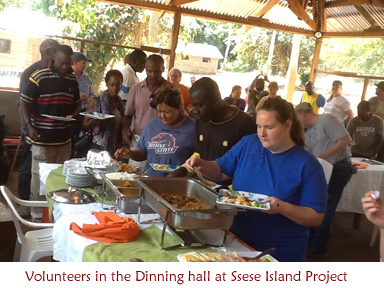 The dinning hall is finished and volunteers use it. Our CSH cheff is educated well to prepare good food. However, long term volunteers cook for themselves. Fish is always on the menue since this project is located on the island. Talapia and Nile Patch fish are more common. Cooking is done by firewood, gass cooker and chacoal. Other foods are purchase from the mainland, Masaka town or Kampala. Transport to and from the island is by ferry freely donated by government. 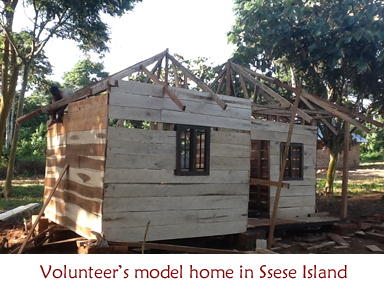 Short-term volunteers are working hand in hand with our local experienced builders in the picture below. They organize money for the buildings before they come. They come with money to cater for themselves with the help of CSH/Flamart both for Project and their Upkeep. It is always fun serving God's children in this way.